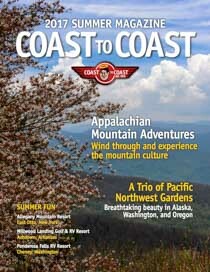 These are all great magazines, and we have been avid subscribers as well as contributors. In case you don’t subscribe or didn’t catch a particular article of ours that interests you, you can read some of them from this page (below). The articles are grouped by general category and are listed in reverse chronological order. The stories are written by me (Emily) and the photos are both mine and Mark’s. Arizona is crawling with wildlife. Here are some great places to see the special critters of the southwest. Following Nova Scotia’s Cabot Trail on Cape Breton Island we see stunning seascapes and cute harbors. Coastal travels from the pretty lighthouse at Peggy’s Cove to picturesque Lunenburg and Mahone Bay. Following the Blue Ridge Highway through Virginia, we find blue grass music, wineries and majestic mountains. Few people venture to the far northeast corner of America, but the seaside villages and local color are not to be missed! We explore a lesser known Amish community and enjoy some wine tasting between Amish farm outings. From craggy shores to sweet harbors to Rockefeller’s network of “Carriage Roads,” Acadia National Park rocks! 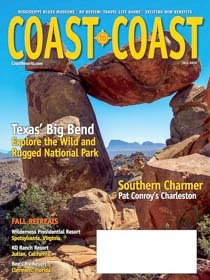 Big Bend National Park is ruggedly beautiful, from the Rio Grande to mountaintops and desert rocks. A daytrip to Mexico is a must! We take a trip up Mt. Washington on the historic and unique Cog Railway to the Weather Station up top. From the rivers east of Bend to the snowcapped peaks of the Wallowa Mountains, eastern Oregon is a little known paradise. Big Bend National Park has mountains, deserts and rivers as well as ghost towns and a taste of Mexico! The hub of central Arizona is Phoenix, but just outside the city lies a treasure trove of natural beauty. Tucked into a far corner of Oregon, the Wallowa Mountains are one of the best kept secrets in the West. An autumn RV trip to the adorable mountain towns of Ouray and Silverton, Colorado, makes for a stunning immersion in fall colors. Sun Valley Idaho is an RVers paradise with camping galore and free concerts, gallery walks and performances everyday. Grand Teton National Park is flanked by a jaw-dropping mountain range, but there are dozens of hidden treasures too. Driving the spectacular Bicentennial Highway through Glen Canyon to Natural Bridges Nat’l Monument and Capitol Reef Nat’l Park. From Crater Lake to the Deschutes, McKenzie and Crooked Rivers, we discover the beauty of Central Oregon. Hiking, biking and thrill seeking amid the red rocks of artsy Sedona Arizona. Beyond the urban sprawl of Phoenix, Arizona, is a world teeming with natural beauty on lovely waterways and hiking trails. Montana’s Gold Rush was not as famous as the one in California, but the ghost towns are just as fascinating. Ensenada is a fabulous destination by RV or boat, and makes a perfect introduction to travel in Mexico. The red rocks of Colorado National Monument and the fall foliage on the San Juan Mountains are kaleidescopic. From fossilized dinosaur bones to ancient petroglyphs, Dinosaur National Monument is magnificent! A rainbow-filled visit to the stunning cliffs, river and dam at Utah’s Flaming Gorge. The sweeping views, brilliant red rocks and friendly animals make Flaming Gorge perfect for the whole family. Some of the best of Utah lies between the more famous National Parks at Bryce and Zion. We visit two desert lakes near Phoenix Arizona, deep in the heart of the cactus-studded Tonto National Forest. From free outdoor concerts to scenic bike paths to towering mountains to history and luxury, this town has it all. A trip down memory lane at the unique RV/MH Hall of Fame museum in Elkhart, Indiana. Two wonderful small town Labor Day celebrations: a rodeo in Helmville, Montana and a fair in Parowan, Utah. Sun Valley Idaho has something for everyone: soaring mountains, glitz & glam, cute bistros and an unusual history. Valley of Fire State Park outside Las Vegas, Nevada, offers up red rock vistas and geological and human history. Describes the intriguing self-guided CD-based tour you can take through Amish Country in the Elkhart, Indiana area. Spring Mountain Ranch, outside of Las Vegas, Nevada, is full of history, intrigue and fun surprises. We visit the unusual RV/MH Hall of Fame in Elkhart, Indiana: library, museum, and home of kudos to the RV industry. Casinos offer RVers a lot besides gambling. From horse racing to a dip in a pool, our favorite casinos are here. Take a visit to the Yuma Territorial State Prison, explore the Old Town, and see a colorful balloon festival. Tiny Pioche, Nevada, was the wildest of the west’s wild towns, with the most murders and one really tough jail. We visit the unique Best Friends Animal Sanctuary near Kanab, Utah, a beautiful & extremely well-funded sanctuary. Goblin Valley is a fantastic Utah state park full of red rock hoodoos. Nearby is an easy & exciting slot canyon hike. Truck manufacturers now provide “puck” systems for easy DIY installation of fifth wheel hitches. Here’s the B&W “puck” Hitch. How to design and install a solar power system on a sailboat that is robust enough for anchoring out all the time. Power inverters make it possible to run AC appliances on DC batteries when dry camping. Here’s the low down. What to look for when buying a heavy duty pickup truck to tow a big fifth wheel trailer. Diesel engine tuners truly put the driver in the driver’s seat of the truck! Here’s a look at how they work. Hints for what to look for in RV house batteries (wet cell vs. AGM) and how best to wire them. Tips and tricks for installing solar panels on an RV roof and a solar charge controller in teh basement. If you are planning on winter camping in your trailer, here’s an easy way to let the sun in and keep the cold out! Upgrading a trailer’s brake system to electric over hydraulic disc brakes makes a radical difference in driving comfort and safety! RV Solar Power is demystified with an easy-to-understand review of the basic components in a solar power installation. Weighing your rig is an important safety measure, and the Smart-Weigh program makes it easy to do. A step-by-step description of the installation of the lifeblood of our cruise: a 60-gallon-per-hour watermaker. A step-by-step guide to selecting and installing a vent-free propane heater in an RV. 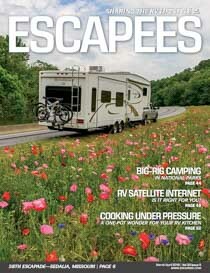 Good Sam Club loved our article in Trailer Life so much (next listing) that they published it in MotorHome too!! Tips and tricks for maintaining an RV’s holding tanks and recommended procedures for doing the dirty deed at the RV dump station. RV rubber roofs and fiberglass roofs each require special care to stay in good condition and remain watertight. Describes the tools and attitude necessary for an independent life of boondocking, or living “off the grid,” in an RV. A step-by-step guide to shrink-wrapping your RV’s screen door for wintertime use. Instructions for installing a vent-free propane heater. These heaters are superior to the furnaces installed in most RVs. 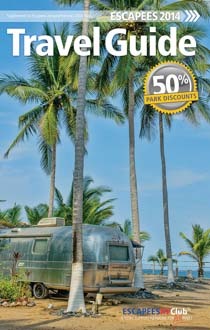 A review of what it costs to go RVing full-time. A presentation of the two solar power configurations we have had on our two trailers. In between the more popular anchorages on Mexico’s mainland coast we discovered some gorgeous hidden coves. The Bays of Huatulco sparkle like jewels on the southern Pacific shores of Mexico and offer the best cruising in Mexico. What could be better than Christmas in colorful, vibrant “Z-town” where the sun is bright and the setting tropical. Our maiden sail down the Pacific coast of Baja from San Diego to Cabo San Lucas was full of beginner’s luck. The “Gold Coast” of Mexico is a collection of 10 or so unique and special anchorages on the Pacific coast. Describes the thrills awaiting charterers in the Sea of Cortez. Editors refer to Groovy as a “charter boat.” What next? 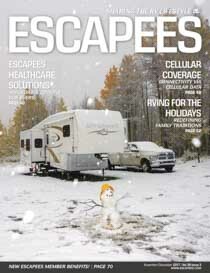 Here are some survival tips to help you make it through a cold winter season in your RV! A review of twelve new fifth wheel trailer models suitable for full-time living. Mexican dentists do top quality work at rock bottom prices. Here are our personal experiences that have kept us smiling for 8 years. Kay Peterson and her husband Joe founded the unique Escapees RV Club. Her story is a thrill and an inspiration. Most folks sell their house before they go full-time, but we leased ours and have been oh-so-happy that we did! RVing full-time sounds like a dream, but the transition can be overwhelming. Here are some tips for how to get from here to there! What makes a great photo? Here’s some hints and tips for putting some zing in your travel photography? Inspiration for future full-timers who are overwhelmed by the challenges of starting a new and exotic life on the road. 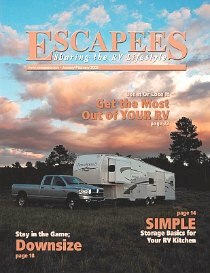 An interview with two special Escapees members who have lived and worked in their RV full-time for 26 years. Some hints and tips for taking a big rig into the mountains. Finding a theme to guide your travels, and moving along at the right pace, keeps full-time travel exciting. A cruising guide full of tips for cruisers making their first voyage to Mexico: weather, navigation, provisioning, internet access, etc. Part II – What’s similar and what’s different about boondocking in an RV in the US versus anchoring out in a sailboat in Mexico? 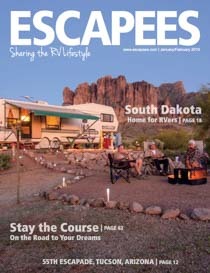 Part I – Written at the request of Escapees Magazine, this is a comparison of the full-time RVing and cruising lifestyles. A summary of the things we’ve learned to help us be both happy and profitable landlords. An exploration of what this business of “Living the Dream” is all about and what its origins were for us. We go south of the border from Yuma, AZ so Mark can get a new crown from a terrific Mexican dentist. 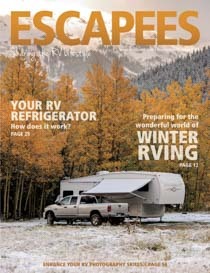 Beginning in January, 2017, we began writing the back page column in Trailer Life Magazine called “Roads to Adventure.” This column focuses on special RV destinations and features a beautiful (and enticing!) photo. We author the column every other month. We found Petrified Forest National Park’s hidden jewels at Jasper Forest and Blue Mesa Trail. Deep in the Canadian Rockies, Moraine Lake is a vibrant turquoise lake tucked between snowcapped mountain peaks. The San Juan Skyway loops through SW Colorado, and erupts in a fiery display of color during fall foliage season! McCall, Idaho, is a little known bona-fide beach town high up in the Rocky Mountains! Watkins Glen is a fabulous gorge, and a visit in the rain reveals a jaw-dropping waterfall. Bryce Canyon is stunning by day, but at midnight the canyon is spanned by the Milky Way! Horseshoe Bend in Page, Arizona, is a breathtaking overlook high above the Colorado River. These articles have been assigned and/or accepted for publication. The titles shown here are my own. Magazine editors often come up with catchier titles. Where possible, I will provide links to the articles some time after publication. Subscribe to these magazines and enjoy these articles as they are published! Here are a few tips for RVers to make their travel photos come alive. Maysville, Kentucky, enchanted us with its gregarious and friendly spirit and charming historic downtown. At Bandelier National Monument we discovered quintessential cliff dwellings complete with ladders to the entrances. Avid boondockers and casual dry campers need to keep their generators in good shape. Here are some tips. From Bangor to Acadia National Park to the furthest east town of Lubec, Maine has lots to offer RVers. Rockport, Massachusetts, is a cute seaside town whose history dates to the Revolution. Here’s a look at a dozen great “first-timer” fifth wheels that are under $50k and shorter than 32′. Custer, South Dakota, is a small town with a big heart, and their 4th of July celebration is top notch. Traveling the back roads of Idaho, there are charming small towns and beautiful mountains at every turn. Zion National Park is known for its towering cliffs, but the fall foliage fills the canyon with vibrant color. Aztec Ruins National Monument and Bandelier National Monument take us bad to the days of the Ancients. Keep Your Daydream adventure travel podcast interviewed us to learn how we launched our travel dream and how we keep it going. 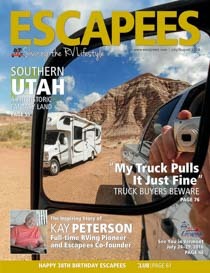 Yahoo Travel feature story about us and other RVers who left convention behind to live in an RV full-time. Writer, blogger and future RVer gave this blog a glowing review in her debut post in a series of blog reviews. Solar panel manufacturer Kyocera Solar featured our sailboat Groovy‘s solar power installation on their website. CleanTechnica featured a story about our marine solar power installation aboard our sailboat Groovy. EarthTechling featured a story about our off-the-grid lifestyle, powered by solar, aboard our sailboat Groovy. 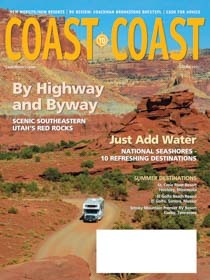 The good folks at Good Sam Club published a brief story about our unusual land and sea traveling lifestyle. 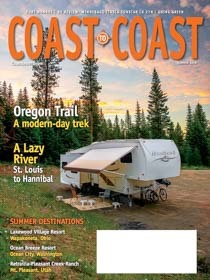 This is the membership magazine for the Coast Resorts RVing organization. 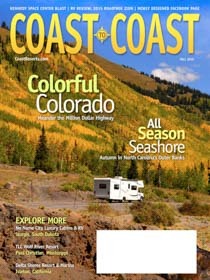 Coast Resorts is a network of upscale RV parks that are available to members at a discounted price, and the magazine covers a full range of RVing topics for its members. 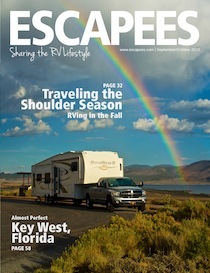 This is the membership magazine for the Escapees RV Club, a club focused on the RV lifestyle, especially for long-term and full-time travelers. 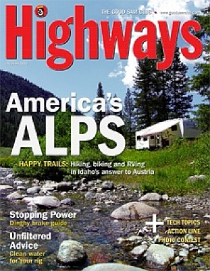 Articles cover topics that are unique to living in an RV for an extended period of time as well as destinations that are worthy of a stop. This is the official magazine for the Good Sam Club. 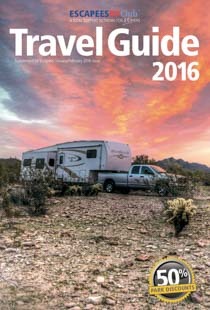 It is chock full of RV tech tips, previews of upcoming Good Sam events, RV equipment reviews and RV destination recommendations. 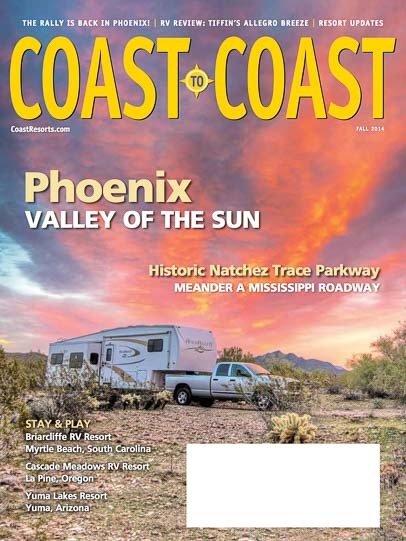 Part of the Good Sam family, this magazine is dedicated to driveable RVs, that is, Class A’s, B’s and C’s, and is filled with motorhome tech tips and great RV destination stories. 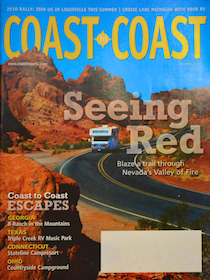 This excellent free magazine used to be found in Camping World, RV parks and other RV-related places of business in the western states. 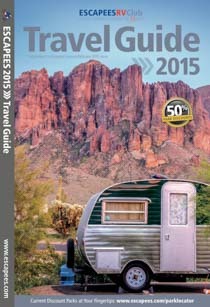 It focused on happenings in the West that could inspire an RVing voyage to a particular destination, from musical events to festivals to country fairs. Unfortunately, it is no longer in print. 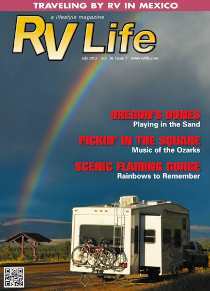 This wonderful, over-sized magazine is one of the oldest regional RV magazines. 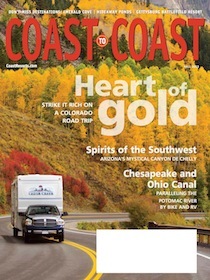 It includes excellent destination articles and interesting news pieces about the RV industry. 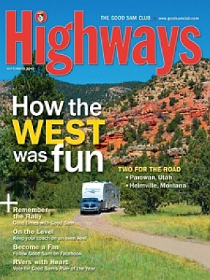 Part of the Good Sam family, this magazine is dedicated to towable RVs, and has tips for both tow vehicles (trucks) and trailers as well as the hitches that go in between. The destination stories also offer inspiring ideas for the bucket list. 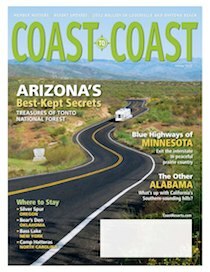 Started in 1997, this delightful cruising-specific magazine is written by cruisers for cruisers with an emphasis on taking your own boat to exotic destinations. This classic American sailing magazine has been spawning cruising dreams for decades. Articles are split evenly between stories about all aspects of living aboard and cruising and stories about chartering both domestically and in foreign waters. Cruising World is available in a Kindle edition as well, including iPad, iPod, iPhone and Android platforms. 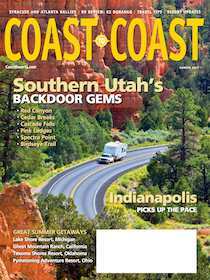 The west coast’s most popular sailing magazine is known for its lively letters to the editor and for keeping tabs on west coast cruisers all over the world. The tone is fun, a bit sassy and sometimes irreverent, but the information is invaluable for cruisers, especially those heading to Mexico. 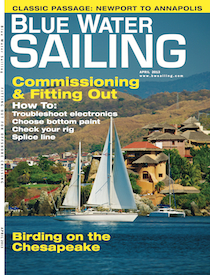 A widely read magazine that covers all aspects of sailing from tips and tricks for beginners to hot charter destinations to technical discussions of boat systems to world cruising explorations by sailboat. From old salt to beginning sailor, there is something in this magazine for everyone. This is an over-sized and beautiful glossy magazine that prides itself on fine writing and dramatic photography. Founded in 1966, I remember issues of this magazine lying on our coffee table when I was a child, fueling my father’s dreams of a circumnavigation (which, sadly, never came to pass). This entry was posted in About & Contact and tagged New, Non-Travel, Popular Articles by Roads Less Traveled. Bookmark the permalink.